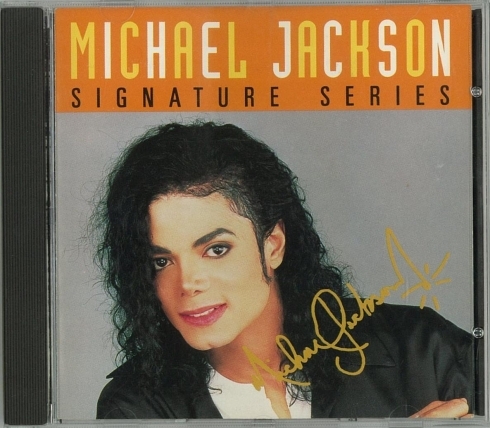 Michael Jackson Signature Series Promo 4 Track CD Album (USA) This “Signature Series” promo CD (#ESK 5400) is said to be the rarest official Michael Jackson CD in existence. It was to be given as a complimentary gift when customers bought a Sony Walkman, but the project was cancelled amid the 1993 allegations and was never commercially released. The four track CD contained two new remixes, "Tommy D's Main Mix" of Wanna Be Startin' Somethin', and the "On The Floor Remix - Radio Edit" of Billie Jean. It also contained the Spanish version of “I Just Can't Stop Loving You” (Todo Mi Amor Eres Tu), which was still very hard to find at the time. 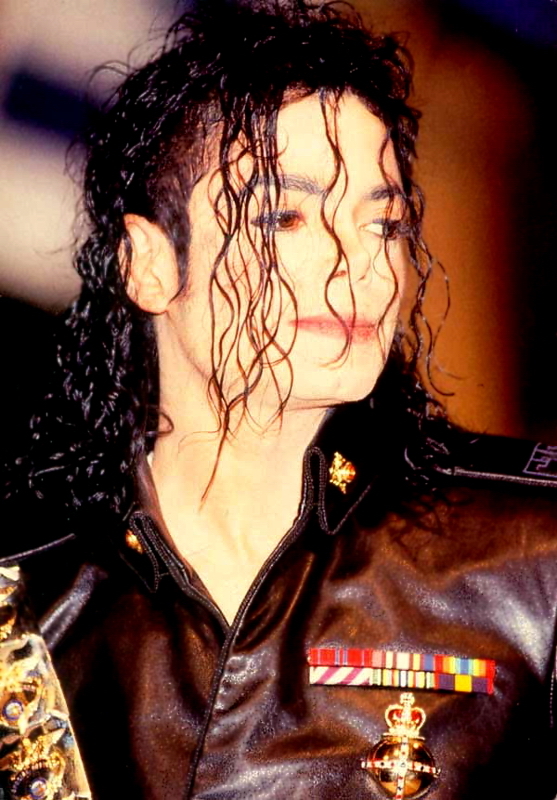 The fourth track on the CD was an exclusive presentation of “Heal The World” which contained narration from Michael describing the goals of the “Heal The World Foundation”. Reportedly less than 50 original copies were made and given to Sony execs and those working directly on the project. 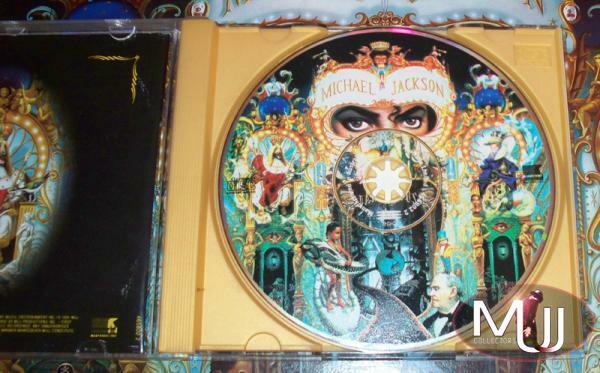 It is easily the most highly sought after CD by Michael Jackson collectors, who routinely pay more than $1500 for it. But BEWARE, as there are numerous fakes circulating around Ebay at any given time! Michael Jackson “Smile” Promo (5 Track) CD Single (South Africa) This South African 5 track promo CD of “Smile” (#CDSIN 228-1), as with most items involving the cancelled commercial release of the song, this remains one of the rarest and most valuable pieces of MJ memorabilia. 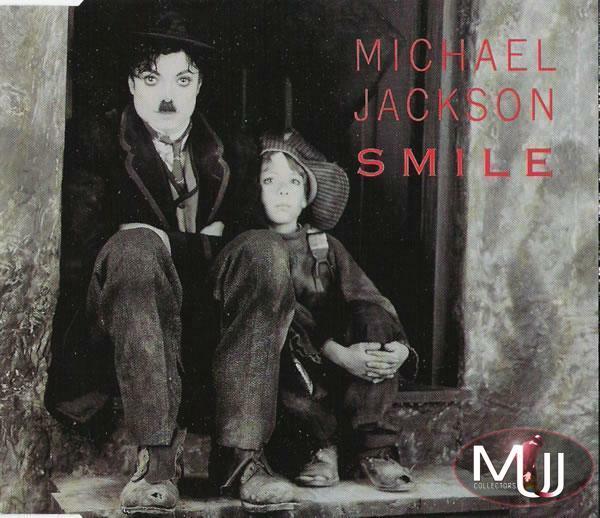 The “Smile” track was to be a 1997 release to help promote the Blood On The Dance Floor remix album (hence the four remixes of “Is It Scary”), but due to a reported disagreement between Michael and Sony (perhaps involving his cancelled performance of the song on “Wetten Das” German TV) the CD was withdrawn one week prior to commercial release. All copies of this promo CD, along with the Austrian CD and Dutch 12” vinyl commercial releases, were to be destroyed. This original CD in excellent condition is worth $1500, but again BEWARE, since, like the Signature Series CD, this CD is often bootlegged with most of the listings on Ebay being worthless fake copies. 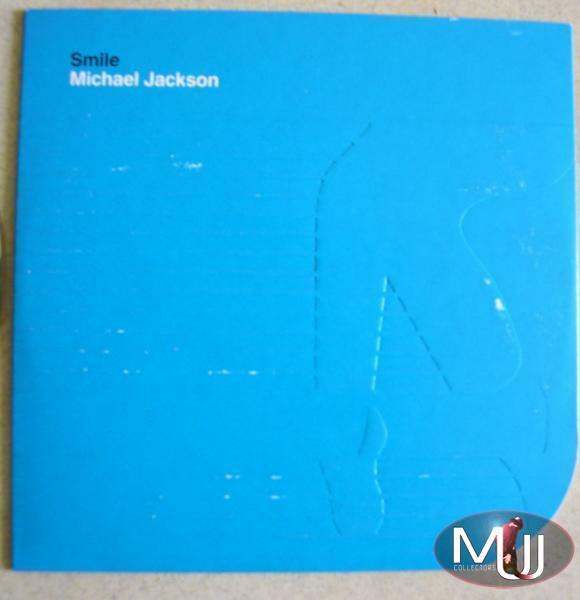 Michael Jackson “Smile” Promo (1 Track) CD Single In Blue Embossed Feet Logo PS (UK) Another one of the most sought after Michael Jackson CDs is this one track UK promo CD single of “Smile” (#XPCD 2222). This CD is housed in an embossed “MJ feet” cardboard sleeve, similar to the promo 12” UK vinyl releases from this period. In excellent condition, this CD is worth $1000. 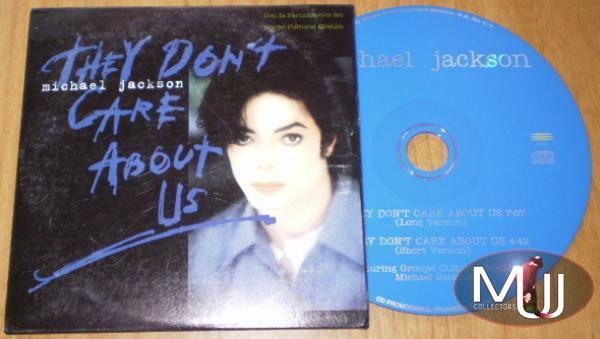 Michael Jackson “They Don't Care About Us” Promo (1 Track) CD Single (Mexico) Uber-rare Mexican promo CD single which features a 4:44 version of “They Don’t Care About Us” (#PRCD 96629) released in 1997. 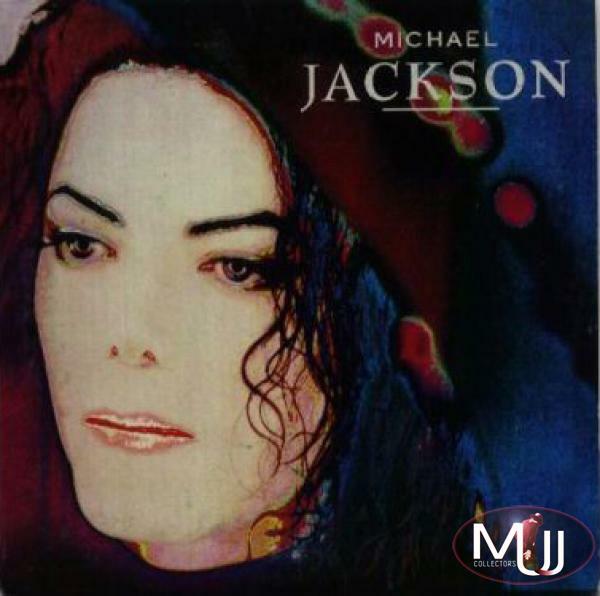 The CD is housed in a totally unique picture sleeve of Michael’s face (apparently from the Scream video) and is often known as the “rainbow cover” because of the colors. In excellent condition, this compact disc is valued at $750. 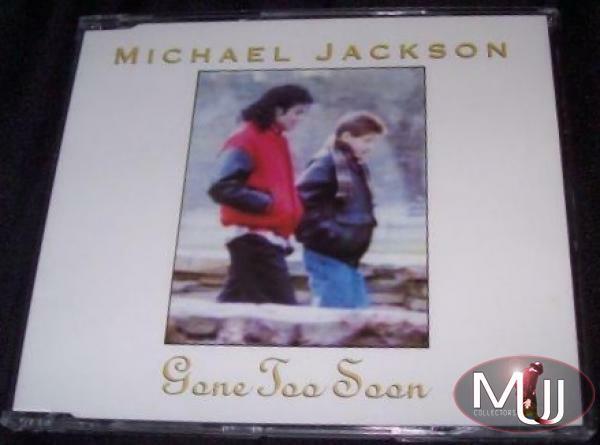 Michael Jackson “Gone Too Soon” Promo (2 Track) CD Single (Australia) This extremely rare 1993 Aussie promo (#6599861) was given to very few studio execs at Sony Australia. It was originally scheduled to be the official picture sleeve of the commercial CD (as it was in all other markets it was released), but it was deemed “inappropriate” by Sony Music Australia in light of the recent allegations, as it pictured Michael with Ryan White. It was later exchanged with the “eye-mask” cover for commercial distribution. In excellent condition, this CD is worth $700. 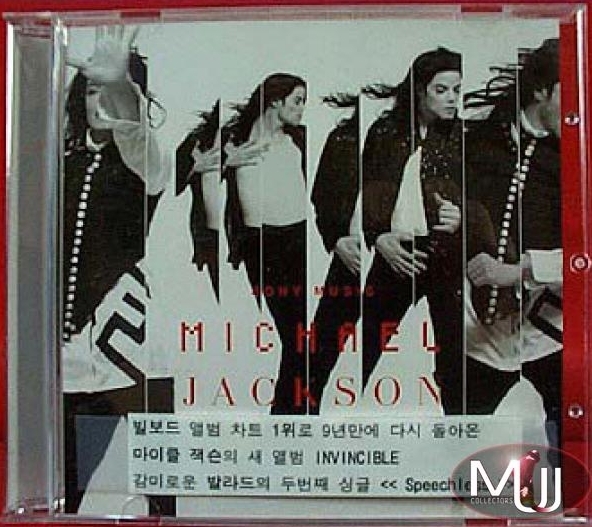 Michael Jackson “Speechless” Promo (2 Track) CD Single (Korea) This ultra-rare 2001 South Korean promo compact disc (#PROM-105) is perhaps the only CD single release for “Speechless”. It also includes a special version of “You Rock My World” with rapper Jay-Z. Another unique feature is the exclusive artwork on and inside the CD sleeve, which was taken from inside the Invincible album. In excellent condition, this CD is worth $600. 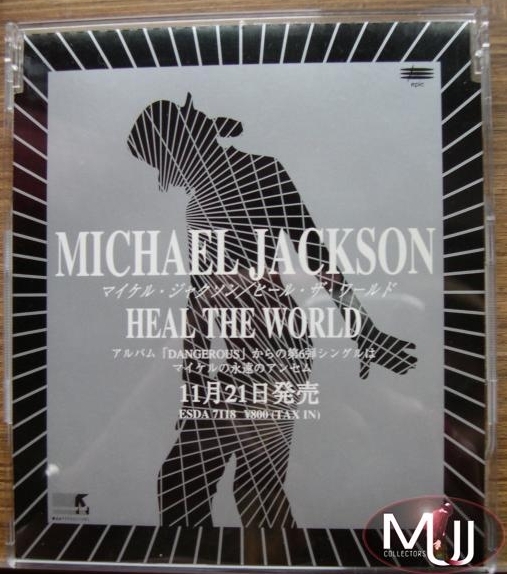 Michael Jackson "Heal The World" Promo CD Single (Japan) This mega-rare 1991 Japanese promo CD (#QDCA-93016) of “Heal The World” comes in a custom “silhouette” picture sleeve, which matches the image on the CD itself. Heavily sought after by serious Michael Jackson collectors, this compact disk is worth about $600 in excellent condition. 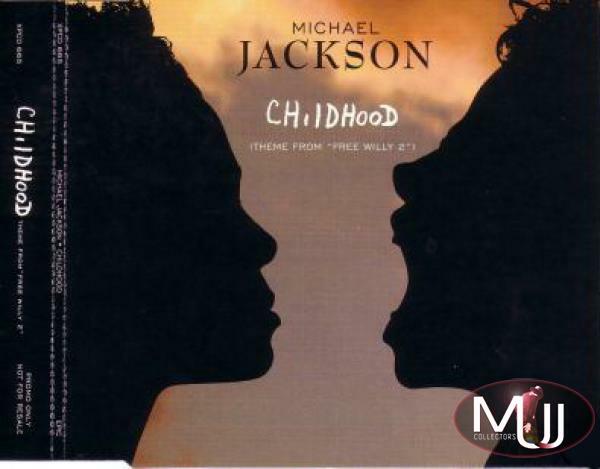 Michael Jackson "Childhood" Promo (1 Track) CD Single (UK) This uber-rare 1995 UK promo CD of “Childhood” (#XPCD 665) is housed in a custom picture sleeve as the "Scream" commercial release. Because this was part of the “Free Willy 2” soundtrack, Childhood was rarely released as a standalone single (apart from this Austrian promo CD) as it was usually included as a bonus track on the Scream commercial CDs. In excellent condition, this compact disc is valued at $500. 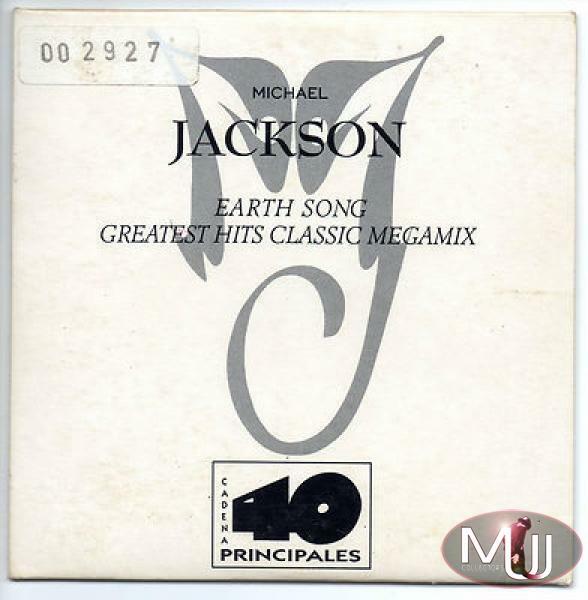 Michael Jackson Earth Song Promo (2 Track) CD Single (Mexico) This Mexican promo for Earth Song (#PRCD 96562) includes the 6:46 version of the track, and also includes This Time Around. 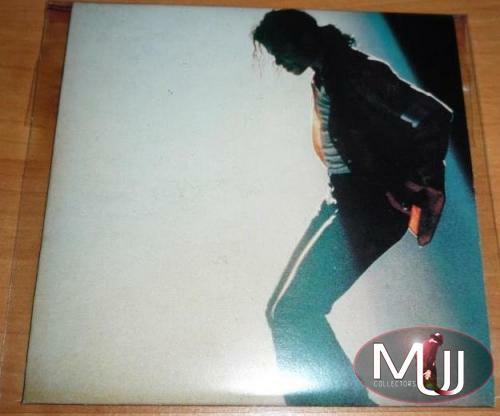 Comes in an “MJ” HIStory logo cardboard sleeve to match the artwork on the disk itself. This CD is worth about $500 in excellent condition. Michael Jackson “Earth Song” *40 Principales* Promo CD Single (Spain) This mega-rare promo CD single (#SAMP-3067) was part of the “40 Principales” Spanish radio station contest where the winner could be included on this exclusive CD release. The winning “Greatest Hits Classic Megamix” was submitted by Juan Belmonte (Pumpin’ Dolls) and is included on the CD. Made in Austria for the Spanish market, where apparently only 100 copies were made. In excellent condition, this CD is worth $500. 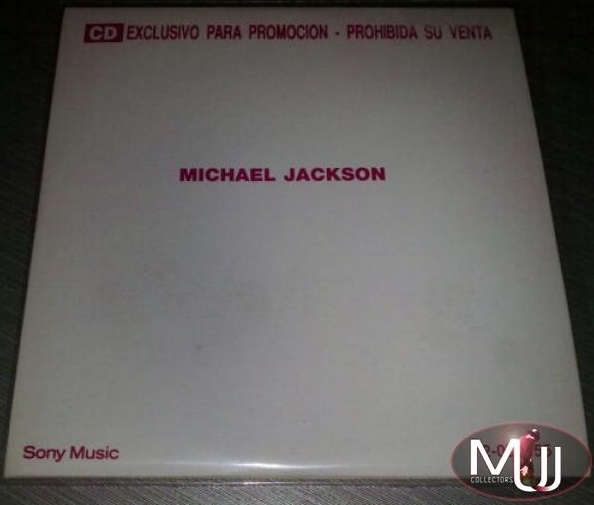 Michael Jackson “You Are Not Alone” Promo (1 Track) CD Single (Mexico) This rare Mexican one track promo CD (#PRCD 96475) includes the 5:45 version of You Are Not Alone. Comes in a black “MJ” HIStory logo cardboard sleeve. This CD is worth about $450 in excellent condition. Michael Jackson “Stranger In Moscow” Promo (6 Track) Picture CD Single (Mexico) This scarce 6 track Mexican promo CD of Stranger In Moscow (#PRCD 96812) is a unique picture CD with Moscow's Red Square in the background. The CD is housed in a custom card sleeve, and features mixes by Todd Terry and Charles Reane. This CD was never commercially released in Mexico, making it even more of a rarity. In excellent condition, this CD is worth $450. 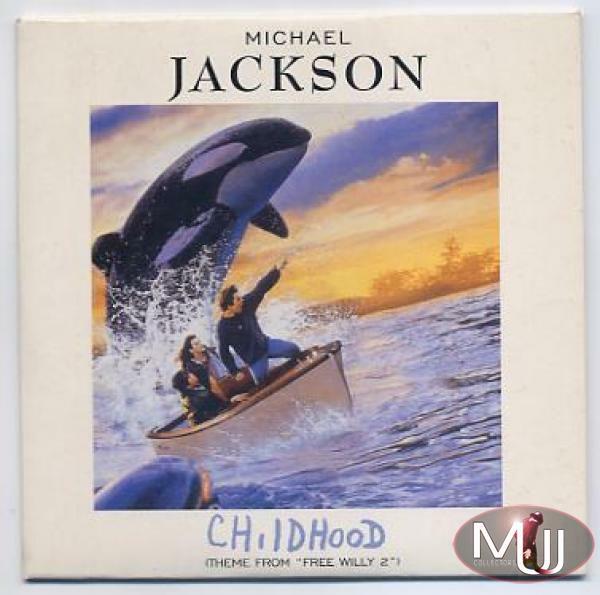 Michael Jackson “Childhood” Promo (1 Track) CD Single (Austria) This extremely hard to find Austrian promo CD of “Childhood” (#SAMP 2774) comes in a totally unique custom card sleeve featuring artwork from “Free Willy 2”. This compact disc is worth about $400 in excellent condition. 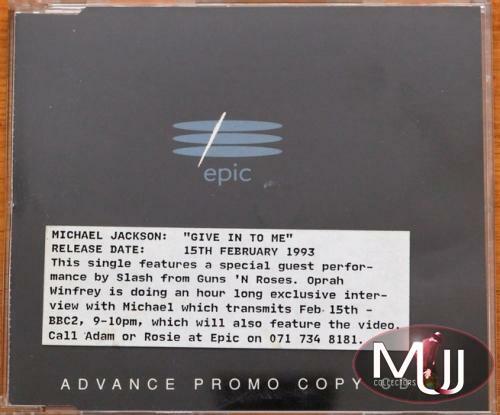 Michael Jackson “Give In To Me” Advance Promo (2 Track) CD Single (UK) This rare “Advance Promo” of Give In To Me (#XPCD 258) comes in a special “Epic” title sleeve, perhaps indicating it was rushed to coincide with the February, 1993 interview Michael Jackson gave to Oprah Winfrey where the video was debuted. In fact, at least some of the sleeves included a typed message from Sony Epic with the February 15th, 1993 simultaneous release date of the CD and the Oprah interview. In excellent condition, this CD is worth $400. Michael Jackson “They Don't Care About Us” Promo (2 Track) CD Single (Olodum Group) (Mexico) This Mexican promo CD single (#PRCD-96720) features the “Olodum Group” from Brazil in two exclusive mixes of “They Don’t Care About Us”, a long version (7:07), and a short version (4:42). Special blue CD that comes in a custom card sleeve. In excellent condition, this compact disc is valued at $400. Michael Jackson “Scream” (Grita) Promo (1 Track) CD Single (Argentina) This hard to find one track promo CD of “Scream” (Grita) from Argentina comes in a unique title sleeve with catalog number #2-000155. In excellent condition, this compact disc is valued at $350. Michael Jackson “Jam” Promo (8 Mixes) CD Single *White Cover* (USA) This rare USA promo CD single of Jam (#ESK 4583) features 8 mixes of the song. 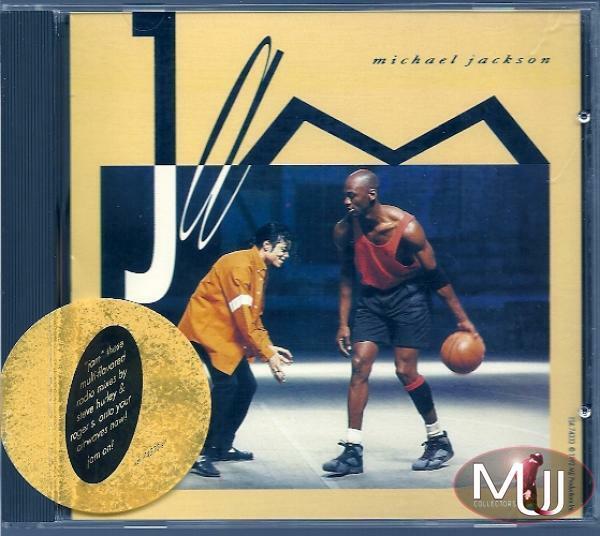 This CD comes in a white cover picture sleeve (with MJ and Michael Jordan) with a custom sticker on the front. This CD in excellent condition is worth $350. 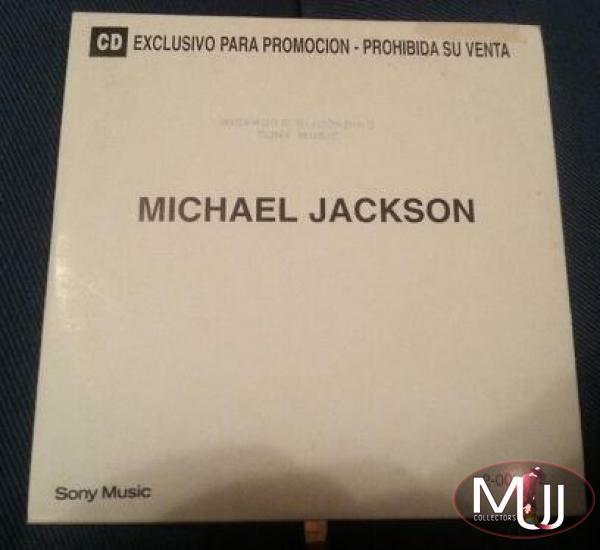 Michael Jackson “You Are Not Alone” Promo CD Single (Argentina) This rare 1995 promo of You Are Not Alone (#2-00172) from Argentina also includes Stranger In Moscow and They Don’t Care About Us, with all of the titles in Spanish. The CD is housed in a custom title sleeve. In excellent condition, this CD is worth about $350. 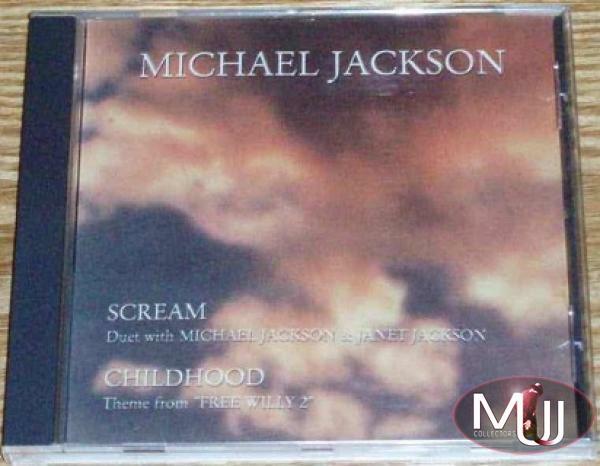 Michael Jackson “Scream” Promo (3 Track) CD Single (Brazil) This three track Brazilian promo CD (#899.127) features two versions of Scream, along with the song “Childhood”. Comes in a unique "cloud cover" picture sleeve. In excellent condition, this CD is worth about $300. Michael Jackson “Another Part Of Me” (5 Track) CD Single (USA) This extremely rare USA promo CD for “Another Part Of Me” (#ESK 1200) includes five mixes of the song. In excellent condition, this compact disc is valued at $300. 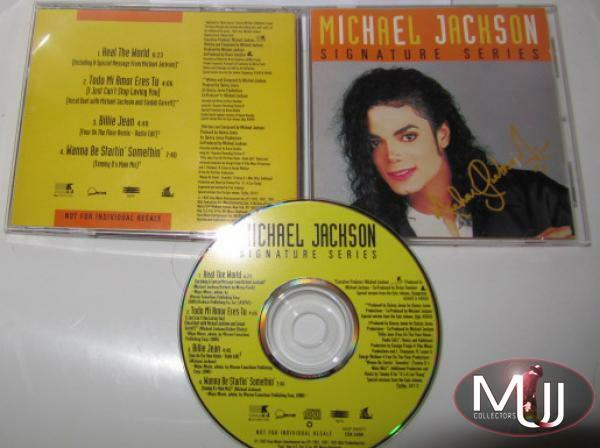 Michael Jackson “Jam” Promo (7 Mixes) CD Single *Yellow Cover* (USA) This companion release to the above 8 mix (“white cover”) USA promo features 7 mixes of Jam and comes in a yellow cover with a different custom sticker. With catalog number #ESK 74333. This CD in excellent condition is worth $250. 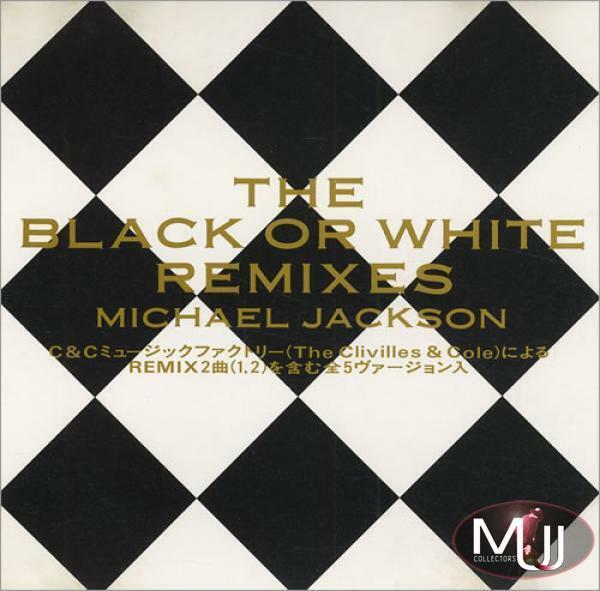 Michael Jackson “The Black Or White Remixes” Promo (5 Track) CD Single (Japan) This Japanese promo CD single includes five Clivelles & Cole (“C&C”) remixes of “Black Or White” (#QY.8P-90098). It's housed in a unique black and white “checker board” style title picture sleeve, also known as the "diamond" picture sleeve. In excellent condition, this compact disc is valued at $250. Michael Jackson “Is It Scary” Promo (2 Track) *Blue* CD Single (Argentina) This 2 track blue CD single from Argentina (#2 000303) from 1997 contains Is It Scary and Ghosts, two songs that were rarely commercially released. The CD has Spanish title names "Tenebroso" (Is It Scary) 5:35 and "Fantasmas" (Ghosts) 5:08. Was not originally issued with a picture sleeve. This CD in excellent condition is worth $230. Visit the Michael Jackson Promotional CD Singles section of our Memorabilia Showcase for a complete list of all Michael Jackson promotional compact disc singles. 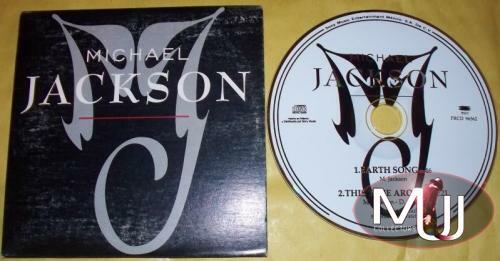 Michael Jackson HIStory LIFEStyle 9 Track Promo CD Album (Philippines) This uber-rare 1996 Philippino promotional 9 track CD album (#ESK 7190) was issued to select radio stations during the HIStory Tour. 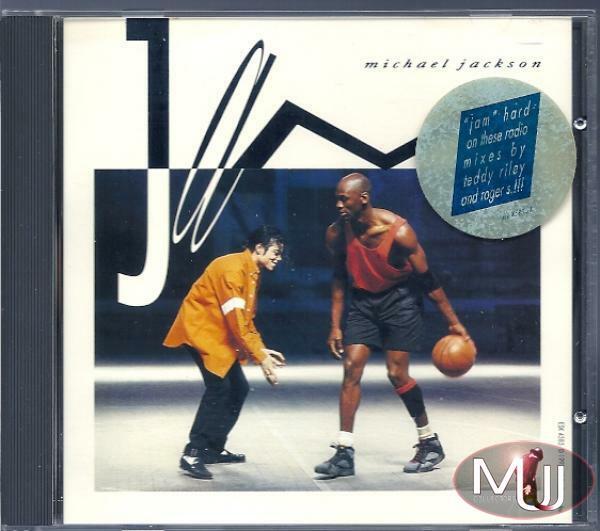 This CD features a unique cover of Michael “on toes” from the Jam video. In excellent condition, this compact disk is worth at least $1000. Michael Jackson Dangerous Tour Souvenir Promo 14 Track Picture CD Album (Malaysia) This fourteen track Malaysian Dangerous Tour promo picture CD (#ESCA 5703 2) is extremely rare because it was withdrawn shortly after the 1993 allegations against Michael and was never released commercially. It is said that less than 350 copies were originally issued to radio stations, and fewer than that remained after it was withdrawn. The CD was to be released to promote the 1993 Asian Dangerous Tour and the Japanese Souvenir Box Set which contained 5 picture CDs. Most of the tracks from that set were contained on this single CD, which was also promotionally released as an audio cassette. 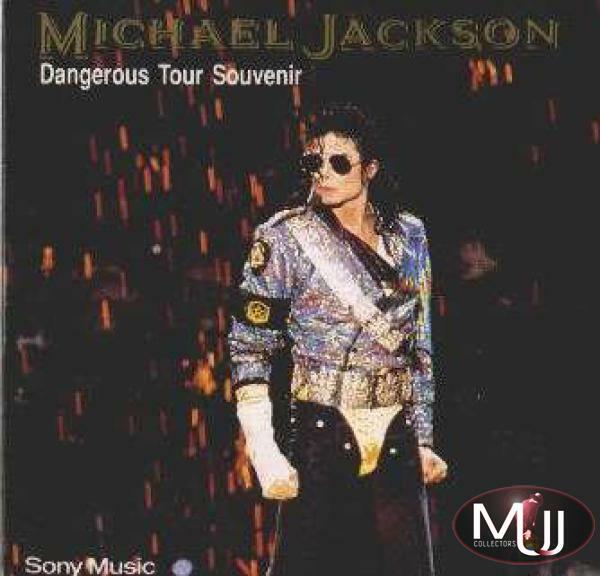 The cover is a unique picture of Michael Jackson from the start of the Dangerous Tour. This compact disc in excellent condition is worth $900. Michael Jackson “Dangerous” Promo Picture CD Disc (Australia) Extremely rare promo only Aussie picture CD of the Dangerous album (#9399746580220). This CD was given to a few staff members of Sony Music Australia. On back of the CD case it reads “Promotion Only Not For Sale”. This CD in excellent condition is valued at $800. 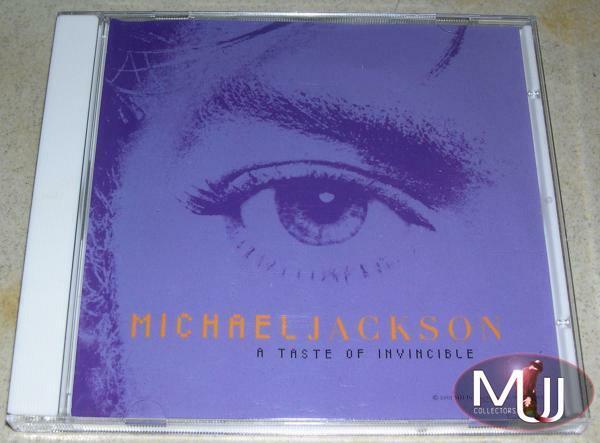 Michael Jackson A Taste Of Invincible Promo 6 Track CD Album (USA) This heavily sought after radio promo-only CD (#ESK 56696) was issued in advance of the Invincible album to select USA radio stations. It contains six tracks from the album: Invincible, Break Of Dawn, Heaven Can Wait, You Rock My World, Butterflies, and Cry. Issued in a purple sleeve, this is another CD that is heavily bootlegged. Hard to find in mint condition since original copies often had a slight crease on the front sleeve cover. This CD in excellent condition is worth around $700. Michael Jackson Dangerous World Tour Pepsi Promo 14 Track CD (Brazil) Mega-rare Brazilian Pepsi promotional 14 track CD (#752.105.2.465802) released to promote the Dangerous Tour in Brazil in 1993. Same 14 tracks as the commercial CD. 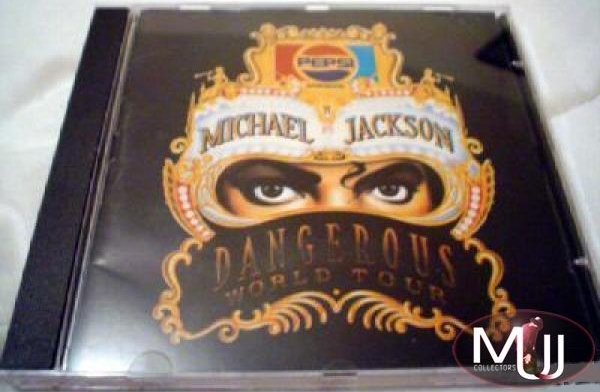 The front cover features Pepsi Dangerous Tour Logo with crown mask and Michael's eyes. The back reads (in Portuguese) "Edicāo Exclusiva - O Show Continua". This compact disc in excellent condition is valued at $650. 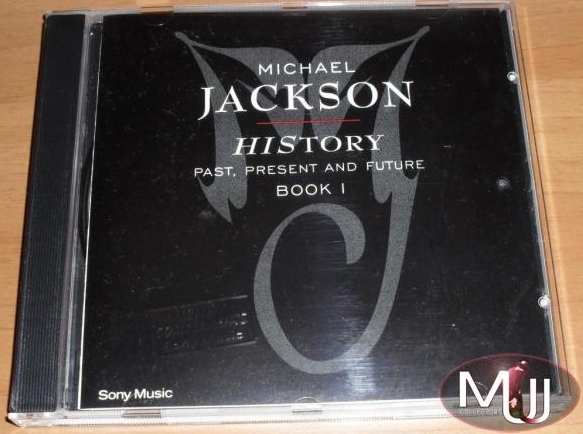 Michael Jackson “HIStory, Past Present And Future Book 1” Promo CD Album (Malaysia) This very rare Malaysian four track promo CD album (#DJ-009) includes They Don't Care About Us, You Are Not Alone, 2Bad, and Stranger In Moscow. Comes in a jewel case with black cover and HIStory era “MJ” logo. This CD in excellent condition is valued at $650. History Of Michael Jackson Promo 13 Track CD Album (Paper Sleeve) (Japan) In 1991, Japan issued three rare promo CDs under the name “History Of Michael Jackson”. This one, a thirteen track release (#QX-8P-95004) features four tracks from the Jacksons and solo tracks from Off The Wall, Thriller, and BAD, and is the rarest of the three. Issued in a paper sleeve with gold writing, this CD in excellent condition is valued at $550. Michael Jackson “The Love Songs” Promo 8 Track CD Album (Brazil) Two years following the 1992 release of the three Brazilian promo vinyl albums, Sony Music Brazil released companion CDs to each, beginning with this one for “The Love Songs” (#899.036). This CD contains the same eight tracks as the vinyl release, with the same unique cover of Michael and Naomi Campbell from the In The Closet video. In excellent condition, this CD is worth about $500. 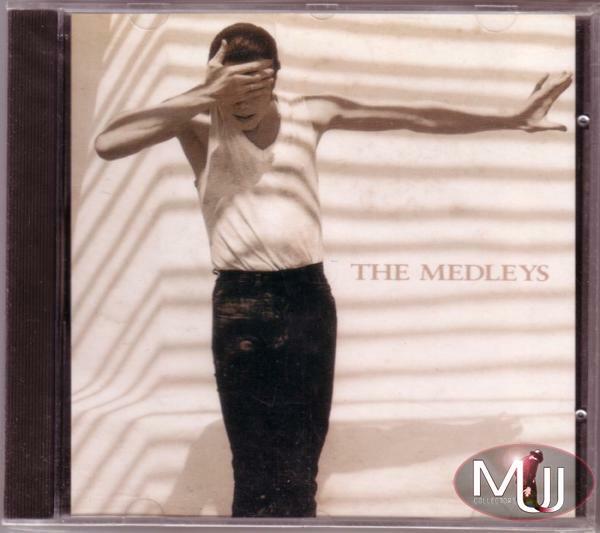 Michael Jackson “The Medleys” Promo 2 Track CD Album (Brazil) Released concurrently with “The Love Songs” was the second of the three Brazilian promo CD releases, “The Medleys” (#899.039). This 2 Track CD features the same “Back To The Past Medley” and “The Dangerous New Jack Medley” as the vinyl release, both mixed & edited by Brazilian DJ Naldo. This CD comes with the same unique custom picture sleeve of Michael from the "In The Closet" video as the promo album. In excellent condition, this CD is worth about $500. The History Of Michael Jackson Promo 16 Track CD Album (Purple Cloth Case) (Japan) The second of the “History Of Michael Jackson” Japanese promo CDs is this 16 track release (#QY-8P-90093) which again features tracks from Michael’s first three Epic solo releases and a few Jacksons tracks. This CD comes with a nice color booklet and is issued in a purple cloth case with a numbered cover. This CD in excellent condition is worth $450. 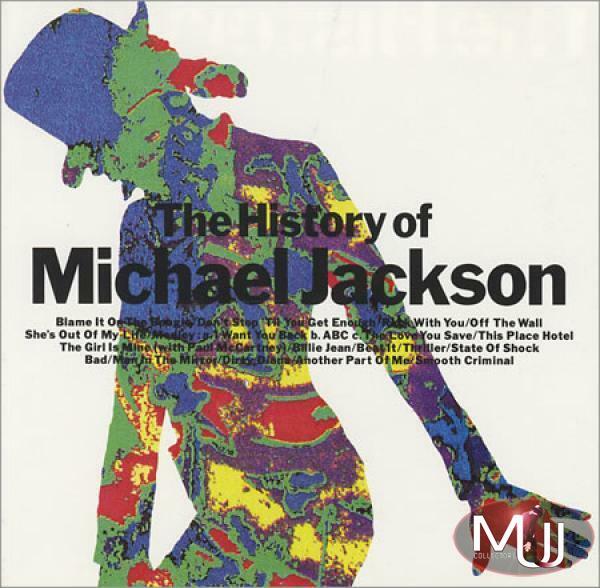 The History Of Michael Jackson Promo CD Album (Michael's Silhouette Cover) (Japan) The third and final “History Of Michael Jackson” CDs includes the same exact track list as the other sixteen track release, with a very unique “colorful silhouette” cover. 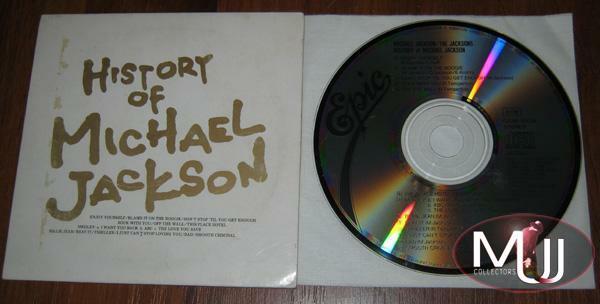 In excellent condition, this rare Michael Jackson promo CD is valued at $400. 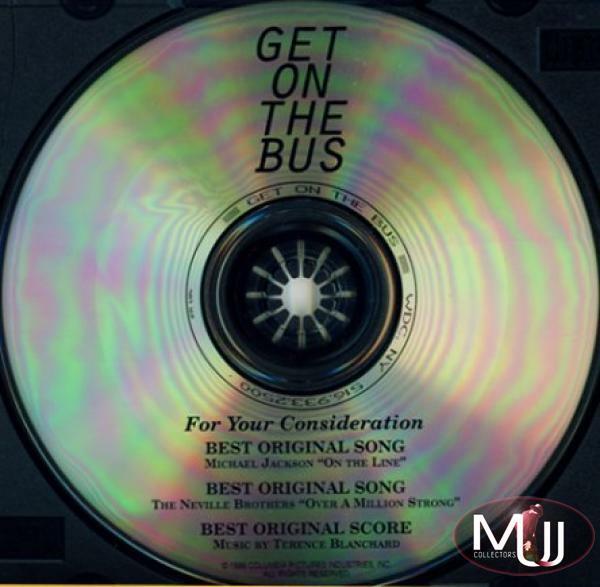 Get On The Bus (On The Line) Promo 7 Track CD Album (USA) This 7 track USA promo CD album (#5169332500) was likely sent to movie studio execs in 1996 for consideration on voting for the Academy Awards. Taken from the Spike Lee movie Get On The Bus, Michael Jackson’s song “On The Line” is featured for consideration for “Best Original Song”. This promo release on the Columbia label was the first CD release of the song, which could later be found on the Ghosts Limited Edition Box Set as a CD Single, released in 1997. This compact disc in excellent condition is valued at $400. 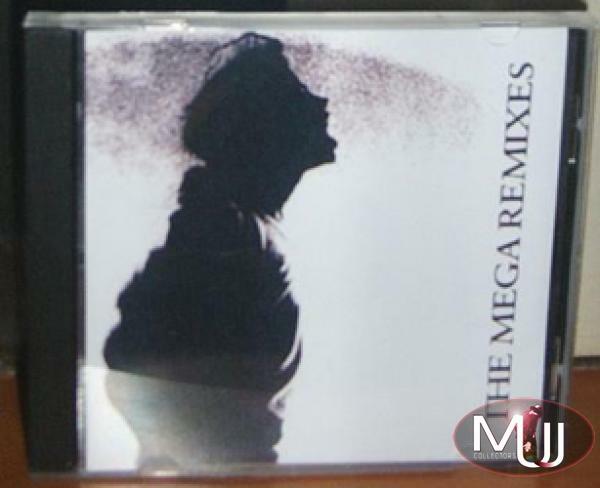 Michael Jackson “The Mega Remixes” Promo CD Album (Brazil) The third and final of the Brazilian promo CD releases was “The Mega Remixes” (#899.035), featuring the same ten remixed tracks as the vinyl release. The cover shows the same picture of Michael from the Jam video as the vinyl release. In excellent condition, this CD is worth about $350. Michael Jackson Epic Records Int’l Single Collection (You Rock My World) Promo 19 Track CD Album (Japan) This scarce October, 2001 Japanese promo CD album (#QDCA-93390) includes an advance edit release of “You Rock My World”, the first Invincible single. Features unique and stellar artwork of Michael’s eye (on the front cover and on the CD itself) and Michael’s toes (on the back of the CD sleeve insert reading “King Of Pop is Back” and again on the back cover). This CD in excellent condition is worth $300. 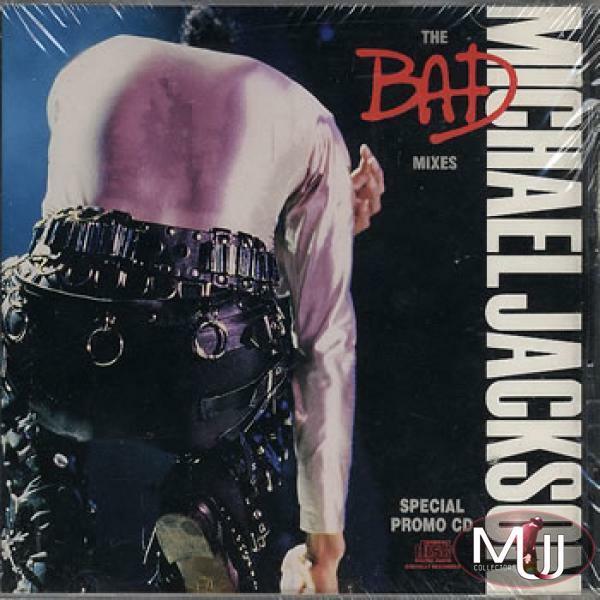 Michael Jackson “The Bad Mixes” Special Promo 13 Track CD Album (USA) Special radio promo-only thirteen track CD (#ESK1215MC), mixed and mastered with Monster Cable. This CD was sent to select USA radio stations in 1988 and includes remixed tracks from the BAD album. Stellar and unique picture sleeve which features a live picture of MJ from the 1987 Japan Tour. Each of these CDs is individually numbered on the cover. This CD in excellent condition is worth $300. Another version of “The Bad Mixes” included nine tracks (#ESK 1215) with the same track listing as the 13 track CD excluding four extra mixes of Smooth Criminal (and without the individually numbered sleeve), is worth about $250. Michael Jackson “Blood On The Dance Floor/HIStory In The Mix” In-Store Promo 13 Track CD (Australia) This Aussie advance promo (released 05/14/97) of Blood On The Dance Floor (#487500-PRO) was for in-store promotional use. Custom red disc in generic die-cut sleeve. This compact disc in excellent condition is valued at $200. 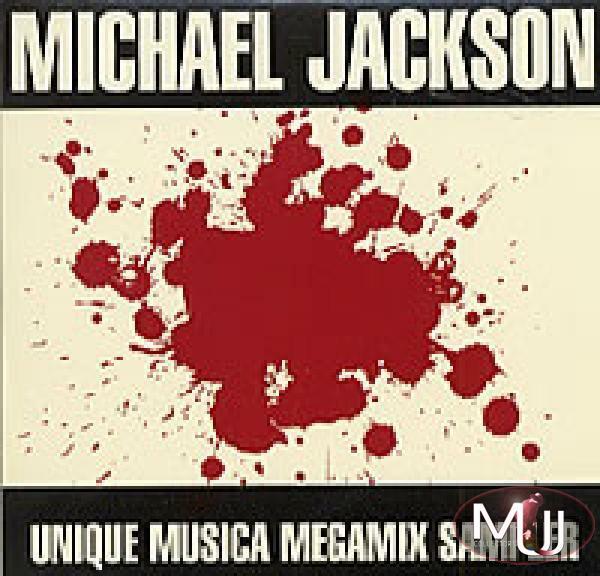 Michael Jackson “Unique Musica Megamix” 3 Track Promo CD Album (South Africa) This scarce South African promo 3 track CD album (#CD SAMPLER 5) features three Michael Jackson Megamixes. CD comes inside a case with blood spot stains on the front cover. This CD in excellent condition is valued at $180. Michael Jackson “The Ultimate Collection” 4 Acetate CD-R Set (Japan) This extremely rare Japanese acetate set (#MHCP 534-538) includes 4 CD-R’s from The Ultimate Collection box set (but not the DVD of the Bucharest show). It includes 4 silver CD-Rs pressed as a test for the Japanese box set due in November 2004. Each comes with a black paper sleeve with tracks and tests in Japanese. In excellent condition, this acetate box set is valued at $500. 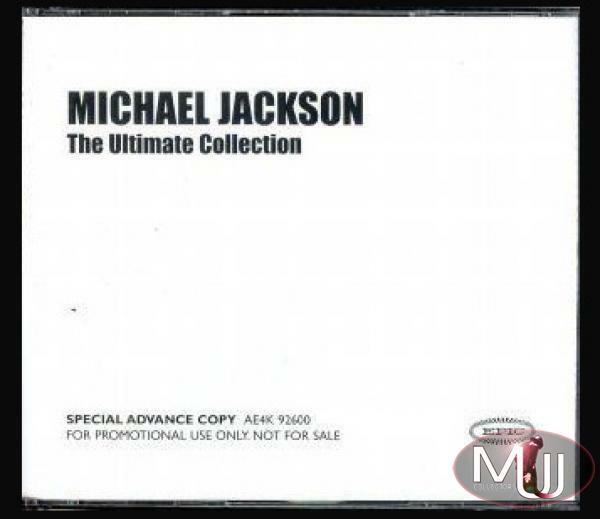 Michael Jackson "The Ultimate Collection" Special Advance Copy Promo 4 CD-R Set (USA) This advance promo of The Ultimate Collection (#AE4K 92600) was issued in 2006 to promote the upcoming commercial release of the box set. It includes 4 CD-Rs from the box set, and a DVD-R (of the Bucharest Dangerous Tour show). This acetate box set in excellent condition is valued at $350. Michael Jackson “We Are The World” Epic 2 Track CD-R Acetate (Japan) This Japanese CD-R acetate (#MDCH80029) was issued in 2004 to promote The Ultimate Collection box set. 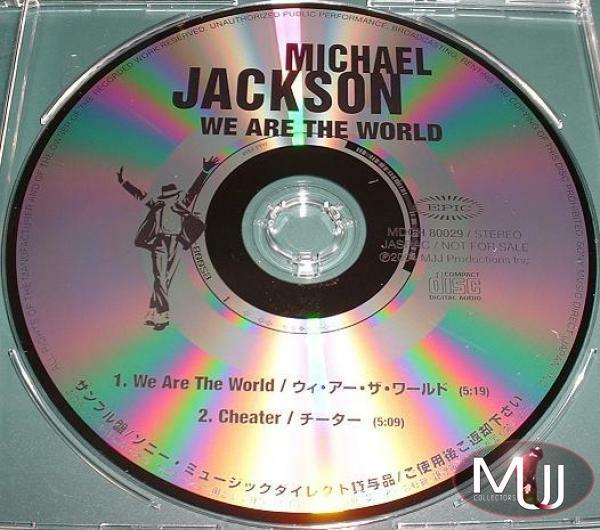 In addition to the 5:19 demo version of “We Are The World”, this CD-R includes the previously unreleased track of “Cheater”. This acetate CD is valued at around $300. 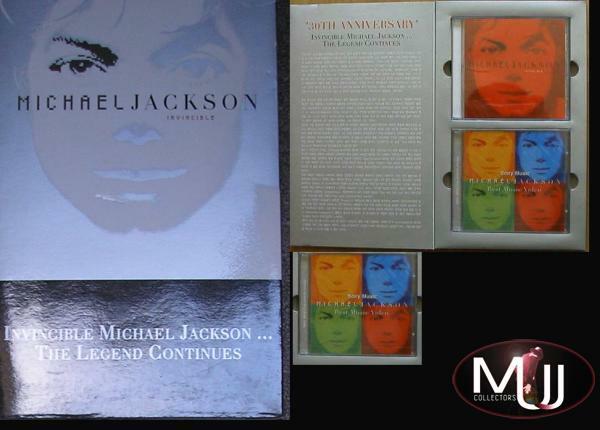 Michael Jackson “Invincible: The Legend Continues” 2001 Promo CD+VCD Box Set (Korea) This extremely rare promo-only box set (PROM-103) was produced by Sony Music Korea in 2001 to promote the Invincible album and Michael Jackson’s “30th Anniversary” solo career. It includes the 16 track Invincible CD which features a 30th Anniversary commemorative fold-out booklet with Korean literature, and a 9 track promo only VCD entitled “Best Music Video” which includes “You Rock My World” and eight other short films. It’s housed in a 12"x 7" silver tinted box featuring the Invincible album artwork with Korean text. Said to be less than 50 of these in existence, this promo box set in excellent condition is worth over $800. 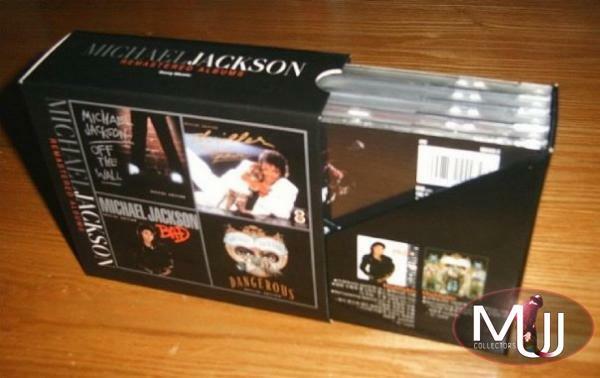 Michael Jackson "Remastered Albums" Promo 4CD Box Set (Korea) This 2001 Korean promotional box set contains the four remastered CDs of Off The Wall, Thriller, BAD and Dangerous. Housed in a special deluxe box with custom artwork. In excellent condition, this promo box set is worth $600. Michael Jackson "Number Ones" Promotional Box Set (Japan) This 2003 Japanese promotional box set for Michael Jackson’s “Number Ones” commercial release includes a Number Ones CD with OBI, a VHS tape with a teaser of the Number Ones promo campaign, a nice multi-page booklet with color pictures, and a sticker set showing all four alternate covers of the album. This promo box set in excellent condition is worth $600. Michael Jackson “Invincible & Remastered Versions” Promotional Box Set (UK) This UK promotional box set contains five CDs including Invincible (in custom picture slipcase) and the four 2001 remastered special editions of Off The Wall, Thriller, Bad, and Dangerous (all in embossed slipcase picture sleeves). The set is housed in a black numbered box with silver printed titles and “MJ feet”. In excellent condition, this promo box set is worth $500. 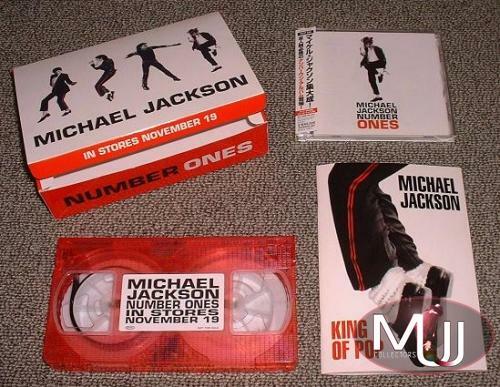 Michael Jackson “Number Ones” Promotional Limited Edition 4 CD Box Set (UK) This very rare promotional four CD UK box set (#XPCD 289) from 2003 includes all four unique covers of the Number Ones CD. Comes in special box with “MJ feet” picture on front. This promo box set in excellent condition is worth $500. 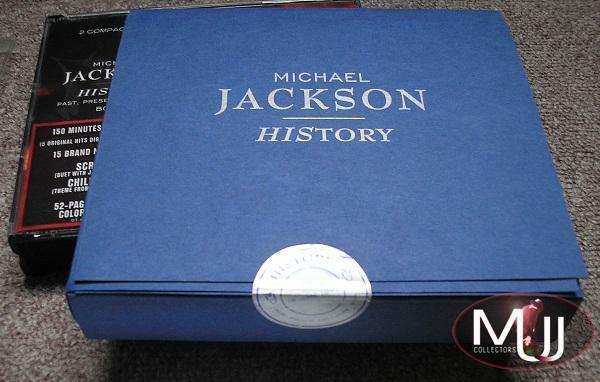 Michael Jackson “HIStory” Promo CD Album In Blue Box Set (UK) 1995 UK promotional box set containing HIStory 2 CD box set album plus press info, released to the UK media to present the new album. The CD set is housed in a thick blue paper casing with a silver seal. In excellent condition, this promo box set is worth $500. Visit the Michael Jackson Promotional CD Albums section and our Compact Disc Showcase for complete listings of all Michael Jackson CDs and limited edition box sets. Also be sure to read our article on the Rarest Michael Jackson Commercial CDs and our extensive articles on the Rarest Michael Jackson Records: Rarest Michael Jackson Albums, Rarest 7" Singles, and Rarest 12" Singles! For suggested additions or corrections, please email us.